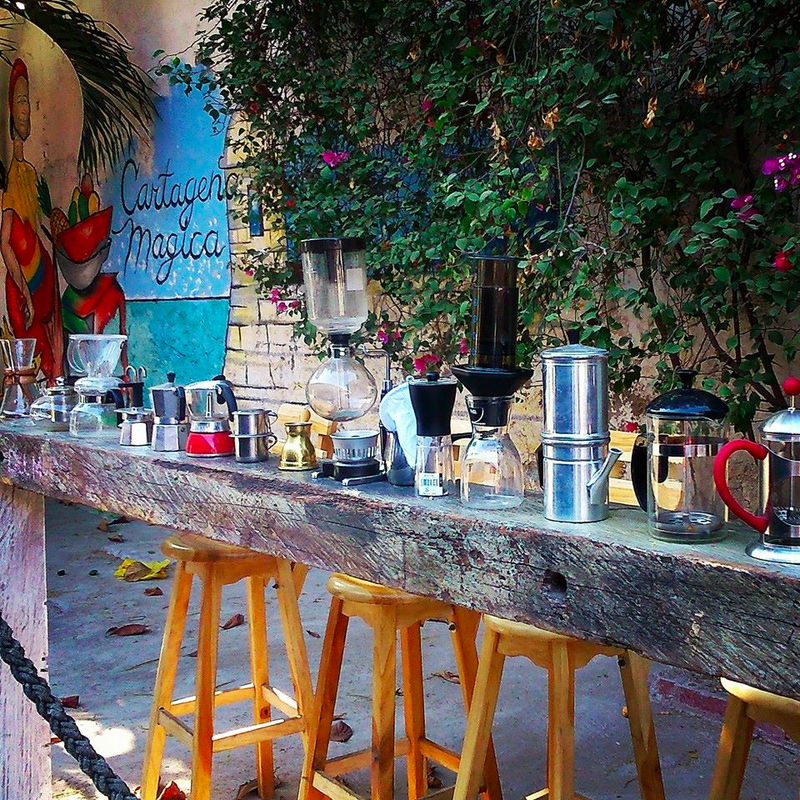 Deep aromas of freshly roasted coffee will tempt you into Café del Mural, tucked away on an artsy side street off the roaring Calle Larga in Getsemani. David Arzayus Mercado, owner and coffee encyclopaedia will take your tastebuds on a wonderful sensory journey. This unsuspecting, small and quaint café, adorned with paintings is somewhere in between a bohemian artists den and a scientists laboratory. Don’t expect to see a conventional baristas machine – former engineer, David, uses bunsen burners, beakers, test tubes, siphons along with other apparatus to create the perfect cup of caffeine infused deliciousness. Bursting with flavour, this tangy brew is robust and complex. Passion fruit, sweet pepper from Jamaica and a touch of sugar are ground and muddled in a mortar with a dash of Cuban rum and then blasted with a blowtorch to change the properties of the passion fruit. The concoction is placed in a science beaker above a flame and ground coffee is poured in. Watch it bubbling away in a siphon before it is ready. The result is a fine line between coffee and tea – flavoursome and bold with a huge caffeine kick. David tells us that passion fruit is one of the strongest fruits and its acidity makes it the ideal fruit to be blended with coffee. Delicate and light with citrus notes. The cup itself is steamed and rinsed with lime before a shot of espresso goes in with a wedge of orange – which makes the coffee taste that little bit sweeter – there’s no need for sugar. The perfect antidote after a long day roaming around Cartagena. Not quite a cup of coffee, not quite a cocktail – perfect for the indecisive ones amongst us. 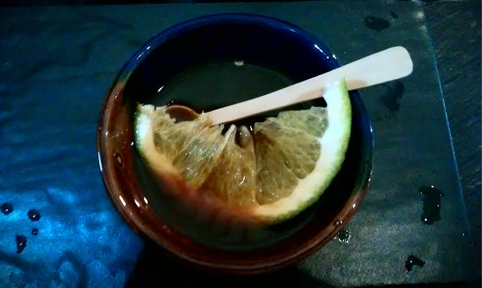 A glass of ice is served with a little sugar, Kahlua and slices of green orange (traditionally lemon) alongside an espresso. 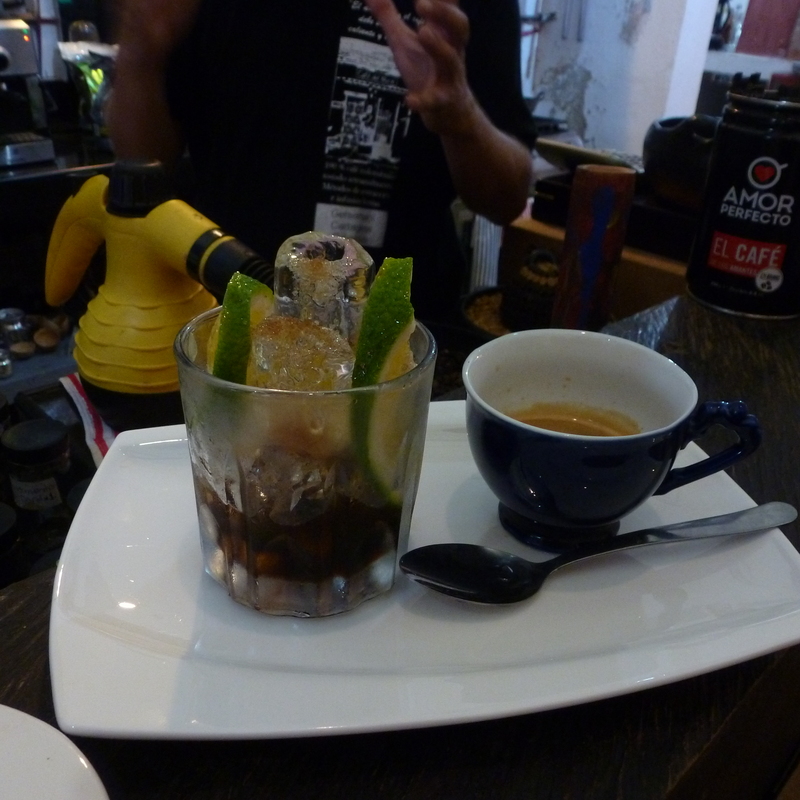 Taste the espresso first and then try the icy mixture immediately afterwards. Pour the espresso into the glass and you´re left with an exquisite, delectable fusion that you’ll want to guzzle all in one. This is what you need if you’re craving a caffeine injection when the Cartagena sun is too hot to bear. You could happily while away many an afternoon here mulling over which bean to try next and absorbing the knowledge from David, the ‘Heston Blumenthal of coffee’. After this experience you will no doubt want to take your own unique bag home – have it roasted in front of you and try your hand at grinding the beans to just how you like them – a must for gourmet coffee aficionados. 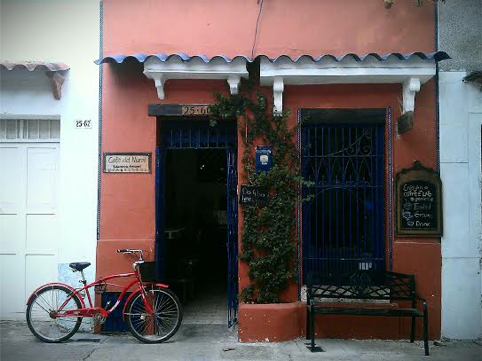 There’s absolutely no better place for it, get your coffee geek on at Café del Mural in Cartagena – where a fusion of art, science and flavour meet.